Without a doubt, the Pono Kai Zen Retreat is the finest unit on this 15 acre property. 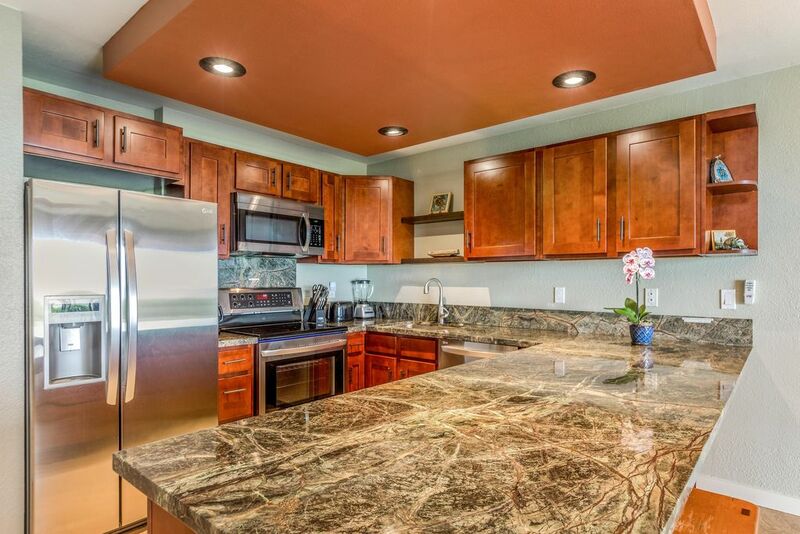 This 2 bedroom 2 bath condo is literally only steps to the warm Pacific Ocean! Golden sunrises, warm trade winds and shimmering waters next to a mile long sandy beach. Those are just a few of the things that come with this beautiful condo! -	A brand new “state of the art” Kitchen with mahogany cabinets, stunning Rainforest marble countertops and all stainless appliances. When not enjoying one of the many excellent nearby restaurants, this fully equipped kitchen will serve you well when preparing your own gourmet Island meals. -	A huge Master Bedroom featuring a beautiful King bed w/ bamboo carved headboard and top of the line mattress. Whether lulling yourself to sleep listening to the gentle waves or waking to a beautiful sunrise. This Master bedroom is truly a retreat within a retreat! -	Check out the spacious Master Bath , unique to the property! Huge custom walk-in Travertine shower with modern sleek fixtures. A beautiful double vanity with Balinese stone vessel sinks and a Brazilian gold travertine counter. -	The living/dining area features a Queen size sofa/bed great for the kids or extra guests. Open the sliding glass doors and you are on the lanai, perfect for sipping the morning Kona coffee or an afternoon beverage! Just steps beyond is the manicured lawn and the beautiful beach. This amazing unit definitely has a 5 star feel to it for a modest price! The Pono Kai Resort enjoys a fantastic location along the eastern coastline of Kauai, known as the coconut coast, because of the large palm trees that line the coast. From this central location on the island, visitors can easily explore Princeville to the north, Poipu to the south, and other hikes and trails on the island in a timely fashion. Visitors staying at the Pono Kai Resort will enjoy an assortment of onsite activities such as a the onsite pool and hot tub, lighted tennis courts and croquet lawn, shuffleboard, putting green, work-out room, BBQ facilities, and activity desk for booking on-island adventures. Our favorite amenity is easy access the the beachfront paved walking/bike trail that fronts the property and coastline. Explore the scenic trail for miles in each direction. To enjoy the beautiful sounds and feel the ocean breezes, THIS CONDO DOES NOT HAVE CENTRAL AC. We do have two portable units for the bedrooms, and large ceiling fans and ocean breezes. We welcome your stay with us! Aloha! Greg and Aleta live in South dakota. We love our Kauai get away, as the winters are very long and cold here. We went to Kauai the first time in 2011. We loved it right away. We love outside activities. Why Kapaa Town? The first time we went to Kauai, we stayed in Kapaa. It was perfect. It is centrally located, so you can head any direction, and get there quickly. It has wonderful restaurants, and it is perfectly quaint. Pono Kai has so much to offer. With a pool, tennis courts, boche, putting greens. We love the walking trail right out our back door. And don't forget about the beach and ocean that you can hear and see from the lanai. It doesn't get any better than that. With views of the beautiful pacific ocean from the lanai and master bedroom. You will hear the rolling waves all night. I am so glad you enjoyed our zen condo, and your Kauai vacation. The property was lovely, great location, walking distance to shops and lots of great restaurants. We enjoyed the boardwalk and took walks every day enjoying the beautiful scenery. We had a late flight when leaving and the owner was generous enough to let us stay a couple hours extra. Our only complaint was the bed was too firm which may appeal to someone else. Thank you for a wonderful vacation, we would definitely stay here again. I am so glad you enjoyed our Zen Retreat. It was a pleasure working with you. I am sorry about the bed, I am afraid we like it on the firmer side and did pick it out to our preference. LOL. We might have to go somewhere in the middle next time. Wow... this is such a beautiful condo! The view could not get any better... feet from the ocean! Just walk down the path right in front for a few minutes and you are right downtown Kapa'a!! Location was great. The unit itself we very very comfortable. Updated kitchen and bathrooms. Very comfortable beds. I think the best part for us was the fact that there was a cooler, beach chairs, boogie boards, and flippers to use!! What a treat!! Highly recommend this wonderful place to call home while visiting Kauai!!! Oh and of course..... Aleta was wonderful to work with!! Very sweet and easy to get ahold of. Thank you for sharing your great place with our family!! I am so glad you enjoyed it Teresa. You were a pleasure to host. We hope to host you and your family again some day. I stayed at the Eastside Zen Retreat in September 2018. The property is comfortable, clean, and has an exceptional view with beach access directly outside. The owner was pleasant to interact with and responded quickly to any communication. The property was a little worn when compared to the pictures however it is located on a tropical island with constant exposure to salty air. The only thing that could have improved our stay is if the house was a little more stocked with routine household items (garbage bags, toilet paper, dish washing pods). These things were available but in a "very" limited supply. The property is well maintained. Pono Kai is full of friendly people close to shopping, restaurants, and fun activities. I would definitely stay again and would recommend it to anyone interested in a Kauai vacation. Exceptional property location in Kaapa on the East side of Kauai. Full kitchen with ammenities for four. Some dishes in cupboard still had food on surface ; they and glasses needed to be rewashed. Sufficient spices to prepare meals. Coffee maker, toaster and blender (for smoothies) a plus. Beds comfortable. Walk in shower in Main Bedroom another bonus. Smaller bedroom adequate but dark due to low lighting. Lack a full mirror. Location within walking distance of many shops and eateries for breakfast, lunch or dinner. Portable AC units worked well enough to cool the rooms, coupled with fans. Update Blue Welcome folder with working numbers, perhaps menus from local eateries. Condo owner Aleta always replied quickly to any inquiries or concerns. We were a group of four and had a wonderful first experience at Pono Kai in Kauai. Without reservations, we wholeheartedly recommend this property. The unit itself and the complex as a whole were amazing! The condo is gorgeous and well appointed. The huge kitchen is amazing. The best part is that it is walking distance to SO many things! We will definitely be back! Kapaa is a wonderful little town with all the amenities you will need. It is perfectly located on the east side of the island. Easy to go to the north or south shores. Or stay on the coconut coast. For bookings 21 nights and over, we require a mid-stay clean of $100. Guest shall inform Agent in writing of Guest's intention to cancel the reservation. The cancellation policy is as follows: If Cancellation notice is received ninety or more days (90+) prior to the check-in date, a cancellation fee equal to 10% of the reservation total will be forfeited and the balance will be refunded within 7 days from receipt of written cancellation. If cancellation notice is received less than ninety days (0-89) prior to the check-in date, the full booking amount of rent and taxes will be forfeited. Any security deposit and any pre-collected cleaning fees will be refunded within 7 days from receipt of written cancellation. As courtesy to our Guest, if Agent is able to rebook any portion of the canceled reservation, Guest will be refunded to the extent that agent is able to re-book the property. Owner/Agent cancellation policy: In the unlikely event that the property becomes unavailable for any part of the tenancy for reasons beyond the control of the Agent, Owner and/or Agent may cancel this agreement and owner and agent's liability shall be limited to providing comparable accommodations or providing a refund for the portion of the rental term made unavailable.